Lots more interesting than the church by appearance any way. The church consists of a rectangular structure with a triangular end chancel in the east and vestry in the north. The church had several predecessors. The first would have been a chapel in Trosa’s original medieval location further up river. When the town was moved to its present location another chapel was built around 1600. 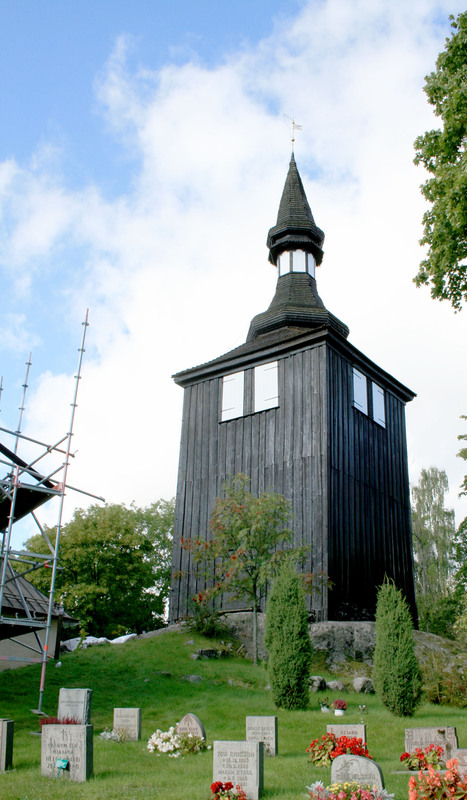 In 1614 the chapel was replaced with a timber church. The present church was built not far from the old one between 1694 – 1710. Since then the church has not seen significant changes except for the addition of a vestry in 1750. The interior has conserved much of its 1700’s character with the whitewashed barrel vault, pulpit and renderings from 1711. – Though given the fact it appears to be undergoing a rather thorough renovation as of September 2012, this may be changing.